Home #BigProtest Why The ‘Proposed 52 Foot-Over-Bridges’ Remain On Papers In Hyderabad? The proposed project of building foot over-bridges (FOBs) at various locations in the twin cities may remain a non-starter at the dawn of the new year. After year-long dawdling about who should take up the project, lack of response for tenders and the upcoming elections have marred the prospect of the FOBs materialising on roads anytime soon. The proposal, initially, was to build FOBs at 58 locations in the city, of which only 10 could be taken up under the Public-Private- Partnership (PPP) mode with scope for advertising on the bridges. With the State government not willing to lend the FOBs for advertisements subsequently, five more bridges which were taken up in later stages were given out by GHMC under EPC contract. Though tenders were invited for 20 in four packages, three had not received any response. Later on, during joint review meetings, the Minister for Municipal Administration and Urban Development K.T. Rama Rao had insisted that Hyderabad Metropolitan Development Authority (HMDA) take part responsibility of the FOBs as GHMC cited lack of funds. Accordingly, a list of 44 FOBs was prepared by the corporation to be transferred to HMDA. However, HMDA had its own issues related to shortage of staff and expressed inability to construct the bridges, tossing the ball back into GHMC’s court. 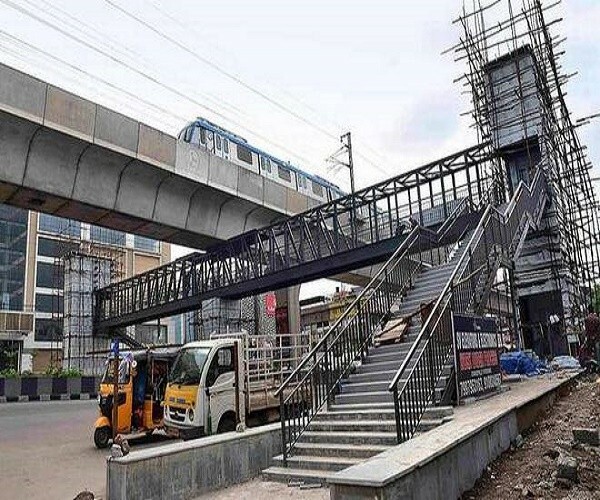 Finally, over three months ago, the MAUD department issued orders for construction of 52 FOBs at various locations in the city, along with skywalks at eight locations, at a cost of ₹208 crore. HMDA was to sanction funds for 39 of them, while 13 were allowed to be constructed in PPP mode, with the caveat of using minimum advertising space by the contracting agency. Subsequently, tenders were called for construction of all the 52 FOBs after dividing them into four packages. “We have got response for only one package, for construction of 11 FOBs. We need to reissue tenders for the remaining three,” said an official from GHMC. Denying that it had anything to do with the lack of scope for advertisement, he said there are very few agencies equipped to take up FOB works. ALSO READ: How The 'Hyderabad Police' Pushing To Make The City 'Beggar-Free'? Previous article‘Join BJP’ In Telangana Within A Minute And If You Want, Get A ‘MLA Ticket’ Within Five Minutes! Why Working ‘Nurses’ Unable To Repay ‘Education Loans’ In India?